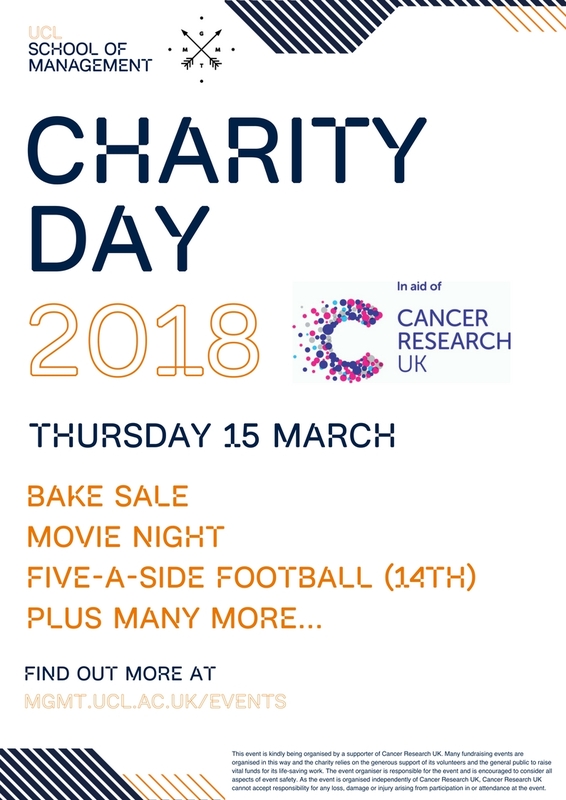 On Thursday 15 March, the UCL School of Management will be holding a series of events in aid of Cancer Research UK. Pastries, cakes, and all things sweet, baked by fellow School students and staff members. Come and play a range of carnival games, or show off your FIFA skills. Mystery prizes up for grabs. Fortune cupcakes, brownies, burritos, spring rolls, samoasa, and plenty more besides will be available to buy. If you would like to get involved with baking, making, or organising, please get in touch with Sherin Desai for details. Put on your boots and take part in our 5-a-side football tournament. £10 entry, with a minimum 40 minutes playing time. Pastries, cakes, and all things sweet, baked by fellow School students and staff members. Plus, new Canary Wharf healthy food store SuBUSake will be doing a sampling session. Show off your FIFA skills, and compete with your fellow students to crown the FIFA champ. Join us and watch Hidden Figures while enjoying free pizza! £5 entry. For tickets, please contact Florence Noel Espitalier or Miros Zohervand. If you have any other ideas of ways to fundraise for this excellent cause, or would like more information, please get in touch with Student Experience Officer Declan Clear.